In a significant move, Sony Corporation has announced its category creating, high performance, ultralight 2.2 pound VAIO C1 PictureBook notebook computer will be powered by the Transmeta 600 MHz Crusoe processor. This processor is built for low power consumption using 18 micron CMOS technology. This is the first consumer product to use the long awaited Crusoe processor. This latest version of the Sony Picturebook, with state of the art Transmeta technology, should open up a wide range of new applications and opportunities in various industries. The use of this processor may signal Sony's intention of releasing of more revolutionary mobile products in the near future. The Crusoe TM5600 processor is capable of running at speeds up to 800 MHz in the near future, while reducing power consumption over previous Transmeta and other competitive processors. This should significantly increase the battery life of the Sony C1 from the current 1 to 6 hour range to a 2 to 10+ hour range, depending on battery pack configuration and computing tasks. By using less power, users gain in several ways. Devices can be made smaller and thereby increasing their mobility since battery packs could be made smaller and large heat sinks and cooling fans can be eliminated. The devices will also run at a cooler operating temperature, since the processor won't generate as much heat. With a base price of $2300, the new VAIO PictureBook C1VN ultra notebook features the Crusoe 600 MHz processor, with a Level 2 cache of 512KB, 128 megabytes of SDRAM and a 12 GB hard drive. During our testing of Intel powered PictureBooks, we have found the unit to be fast and extremely stable. We also find that the Picturebook series is extremely well designed, highly adaptable, easy to use and perform at high levels in both normal and demanding real world conditions. 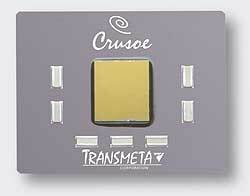 The new Crusoe processor offers the promise of extended power and cool temperatures to an already cool design. I wonder if a new operating system option is in the Picturebook's future as well. The popular progressive scan camera is still built-in and with Transmeta's latest processor technology, I feel these units should fly off the shelves even faster. Copyright © 2006 Jim Bennett All rights reserved.